In the year to end September 2016 new build house prices rose on average by 5.8% across the UK. The regional picture continues to show a North/South divide, with crude average growth (excluding Greater London) now standing at 4.2%, down against last year’s figure of 4.4%, according to the LSL New Build Index. The First Time Buyers HPE Index looks at the average cost of buying a 70 sq m 2 bed home in each region. It compares the property price with the gross average earnings of a full time employee in that region. New Government figures were released in August that show an improving picture for new buyers. On average a 70 sq m home costs the equivalent of 4 years and 4 months gross earnings, which is an improvement on the five and a half years previously reported. There remains a wide regional variation in this figure, but only London and the South East require earnings above five years. 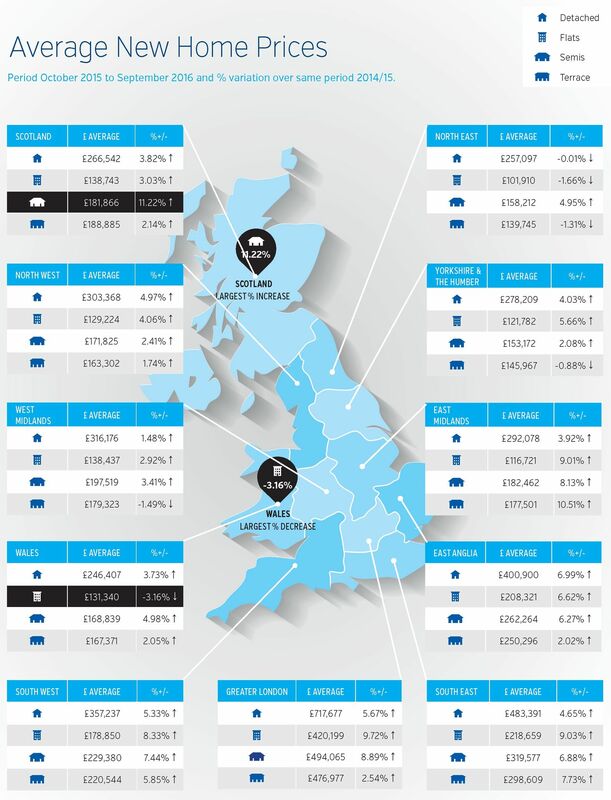 A new starter home on an average salary is most easily afforded in the North East and Yorkshire & the Humber. However house price growth is still relatively slow in these regions, whereas the East Midlands shows strong house price growth as well as a good level of affordability.